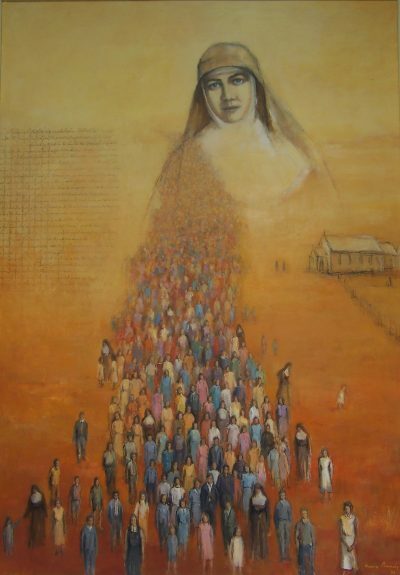 In the midst of the flow of people on this painting, “Mary MacKillop Friend and Educator to the Poor” by Sr Mary Brady you can see a small child running off with a Sister following in their wake. How many times in my life have I chased my own son, my nieces, my cousins and seen the pure joy in their little faces knowing they are both free and safe? It seems like a simple wish but I truly believe at the heart of it, that is what Mary MacKillop was trying to achieve……… for children to be free, to express themselves, to grow, to learn, to be inspired. To live life fully with a sense of optimism and nurturing. In the painting you can also see a simple wooden structure much like the schools that can be found in many of the places where we work. We know what Mary MacKillop also knew, that the structure is less important than the education itself. And an education can change an individual’s life but it also changes the lives of the whole family and community. At Mary MacKillop Today we see the evidence of that in our Aboriginal and Torres Strait Islander scholarship holders, in the Timor-Leste parents who are learning to educate their children and in the volunteers who work with people with disabilities in PNG. At Mary MacKillop Today we see the legacy of Australia’s first Saint written into the hearts and minds of people across Australia and indeed the world. Today it is our supporters who, acting in faith like Mary MacKillop make a world of difference in so many young lives. This Feast Day we ask that you hold the stories of all those that we serve in your hearts. May they all feel your prayers and your support knowing that in the Spirit of Mary MacKillop and Julian Tennison Woods, you are committed to ensuring their dignity is realised.